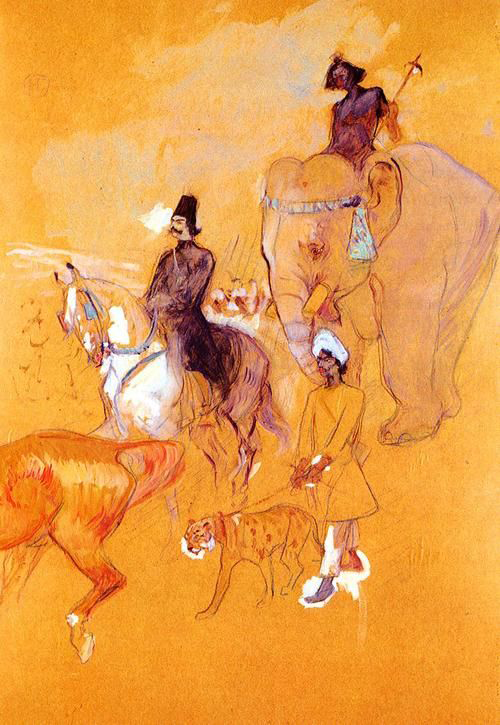 "In the Circus, Work Without Saddle"
At the Cirque Fernando, "Rider on a White Horse"
"Horsemen Riding on the Bois de Boulogne"
"The Procession of the Raja"
Today's inspiration is French Fine Artist & Poster Artist, Henri de Toulouse-Lautrec (1864-1901). 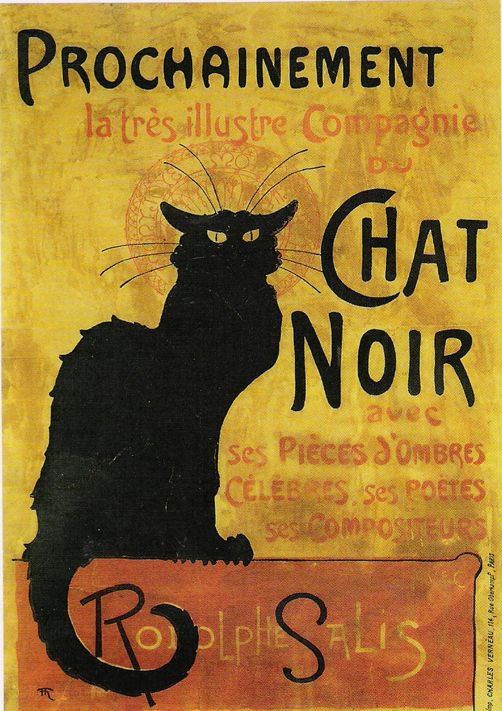 As a young artist, I was very inspired by Impressionists and Poster Artists from Paris. 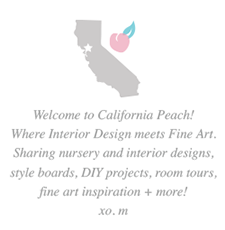 I loved the idea of being a commercial artist. Perhaps this stemmed from my fascination with Illustrators like J.C. Lyendecker, Norman Rockwell and the T.V. show Bewitched, in which you may have noticed Darrin Stephens' job was similar: he was a Graphic Designer, more specifically an Illustrator for Advertising. In any case, the time period, the subject matter (one common to painters around that time in France, dancers) and depiction of "real life," all wrapped up in the whimsy of the color palettes and striking compositions; it's completely captivating. I remember my high school music professor had the work, "At the Moulin Rouge," up on a pin board in the front of the room. I would often pass by and became good friends with the green faced woman contemporarily cropped out of the frame. More recently, the film "Midnight in Paris," captured the night life of these artists perfectly! 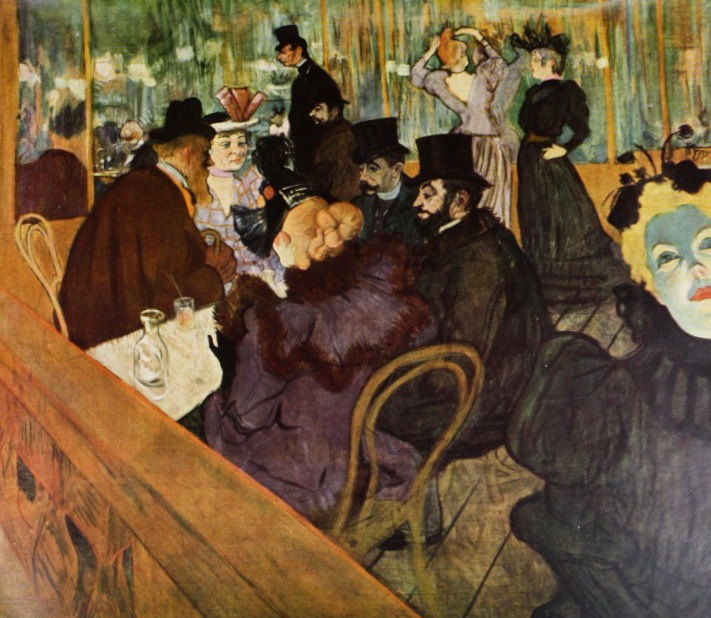 As the film portrayed, I love the fact that many famous artists in Paris were friends and even painted together, as well as the notion that they were influenced by famous artists from previous art movements. Paris itself is a very magical and romantic place. 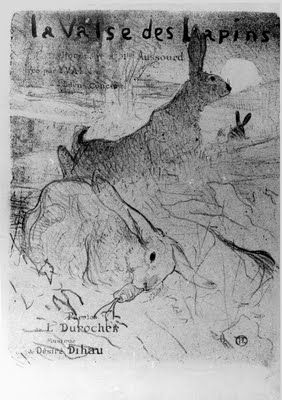 Having taken a trip there with my high school watercolor group and painting the scenes of Paris, including a venture into Montmartre, first hand fostered a strange connection to these artists. Seeing these famous works in person, in Paris, was surreal. 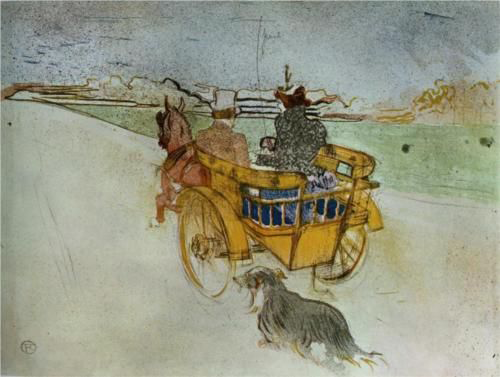 The line work (reminiscent of Heinrich Kley), the unusual subject matter, color choice and application, the strange illustrations paired with non-traditional composition are some of the things that captivate me about Toulouse-Lautrec's work. 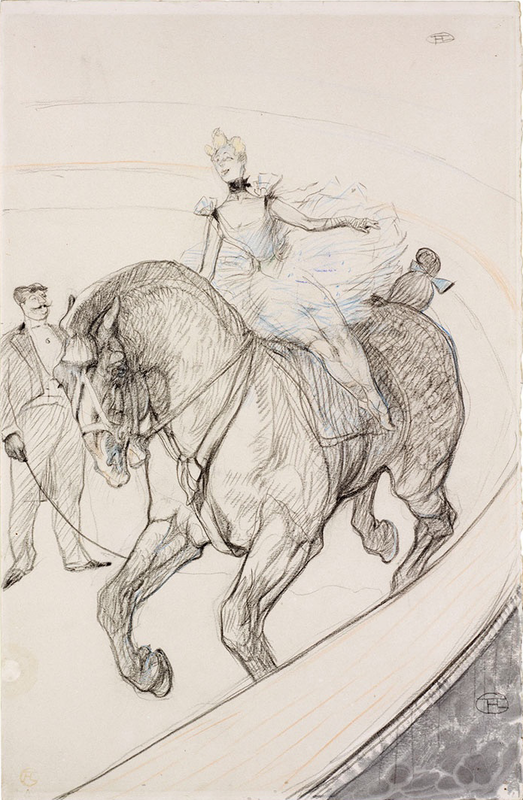 Seeing the work in Paris is a dream, but we are very fortunate, since there is an exhibit of Toulouse-Lautrec's work taking place in California right now! Starting this week, an exhibition of his work is showing at the Crocker Art Museum in Sacramento. I highly recommend attending the exhibit. 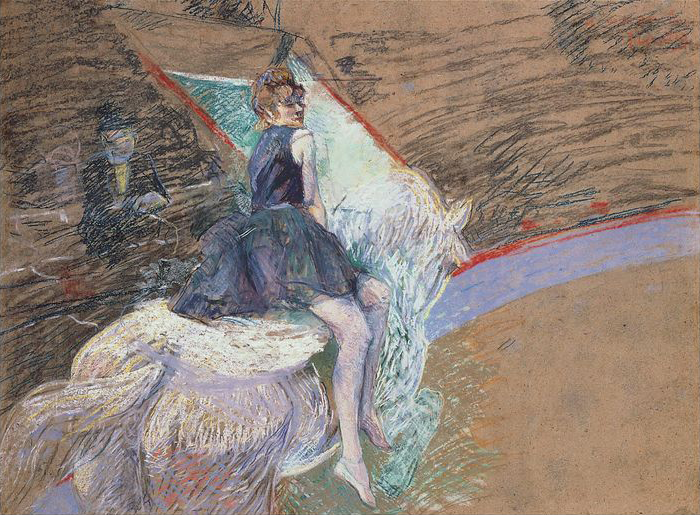 Toulouse-Lautrec and his work are a significant part of Art History. Immerse yourself in 19th century Paris! 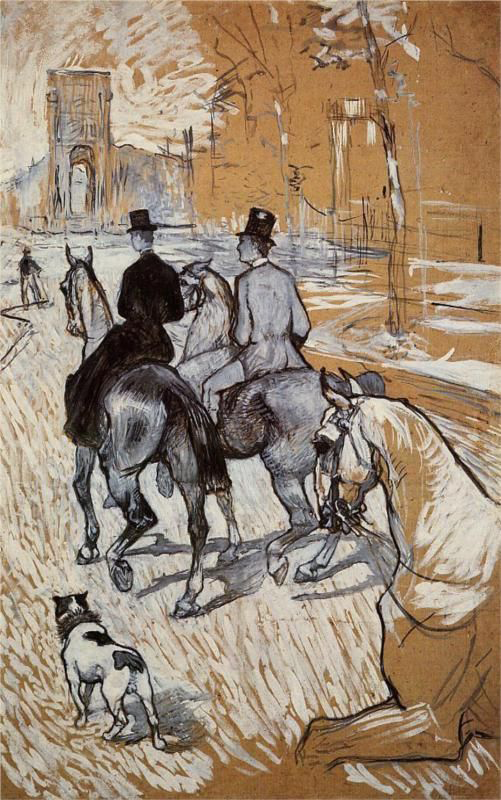 For more information on Tolouse-Lautrec, his art and life, I recommend reading his Wiki article, and to view a comprehensive compilation of his work visit his WikiArt page. An exhibition of his art is currently at the Crocker Art Museum in Sacramento from February 1 - April 26, 2015.